River Valley’s Cole Franklin competes in the boys high school race as part of the Wellston Cross Country Invitational on Aug. 26 in Wellston, Ohio. WELLSTON, Ohio — Once again, the Raiders ran runner-up against Athens. 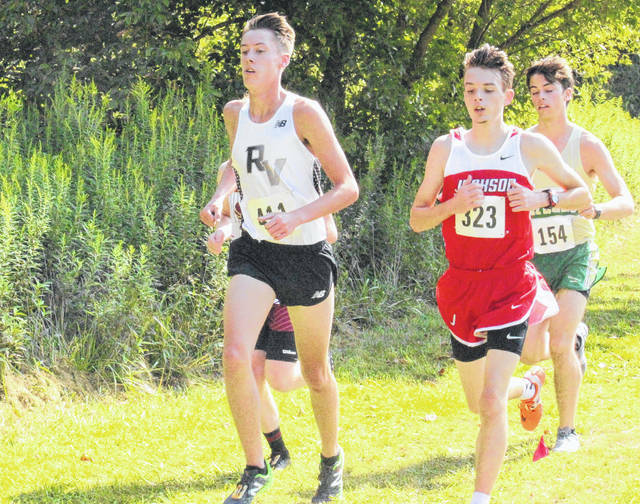 That’s because the River Valley High School boys cross country squad was the Tri-Valley Conference Ohio Division runner-up, as the league’s annual championship meet took place on Saturday at Wellston High School. The Raiders had a pair of top-eight finishers, but Athens’ top five individuals were all among the top seven. The remaining River Valley counting times all placed between 16th and 28th, as the Raiders posted a second-place team score of 61. Athens almost amassed a perfect team tally of 15, but instead settled for a 20 to win the team championship by 41 points. This is the Raiders’ fourth season as a member of the TVC, as they were also runner-up to Athens a year ago after winning the crown two years back. Alexander was third with a 69, while fourth-place Vinton County (99), fifth-place and host Wellston (145) and sixth-place Meigs (169) rounded out the team scores. Only Nelsonville-York, with three runners, did not post a team total. For the Raiders, senior Nathaniel Abbott earned a fifth-place finish and repeat All-TVC Ohio honors, as he completed the 5K distance in 17 minutes and 41 seconds. Abbott finished fourth in the same race last year, as this season, the top seven runners in each race in each division earn All-TVC accolades. Missing all-league by a single spot — and a single second to be exact — was fellow RVHS senior George Rickett, who ended up eighth overall in 18:15. The remaining Raider scorers included senior Kyle Coen (16th in 19:00), junior Rory Twyman (17th in 19:08), junior Cole Franklin (24th in 19:48), sophomore Austin Livingston (27th in 20:14) and junior Caleb McKnight (28th in 20:15). The Meigs Marauders’ six runners were sophomore Landon Davis (39th in 20:59), sophomore Colton Heater (42nd in 21:07), senior Brad Logan (50th in 22:17), sophomore Christian Jones (51st in 22:23), senior Cole Hoffman (59th in 25:01) and junior Brandon Justis (61st in 26:08). Athens had five all-league placers, paced by senior Peter Buckley, who was the race winner in 16 minutes and 43 seconds. Alexander senior Carter Carr was also All-TVC Ohio, as he placed third in 17 minutes and nine ticks. There were 66 runners in the boys high school race. On the girls side, the Lady Raiders (107) were fourth and the Lady Marauders (132) fifth, as there were also six clubs which posted team scores. Vinton County — who had the second, third and fourth-place runners — claimed the team championship with a 28, edging out Athens (32) by a mere four points. Alexander (100) nudged the Lady Raiders (107) for third, while Nelsonville-York — with a 145 — was sixth. Only Wellston, with no runners in fact, did not post a team score. Athens, including race winner senior Rebekah Shoup (20:06), earned three all-league spots — while Vinton County grabbed three as well. The only other All-TVC honoree was Alexander junior Payton Remy, who was sixth overall in 21:03. River Valley’s top four times were senior Kenzie Baker (14th in 22:02), freshman Hannah Culpepper (17th in 22:41), junior Akari Michimukai (25th in 24:42) and junior Josie Jones (29th in 25:00), while the final three scorers were junior Julia Nutter (55th in 28:33), freshman Connie Stewart (56th in 28:50) and senior Natosha Rankin (58th in 29:40). Meigs fielded five runners, which were junior Taylor Swartz (27th in 24:53), junior Madison Cremeans (31st in 25:05), senior Caitlyn Rest (36th in 25:45), senior Ariann Sizemore (40th in 26:10) and senior Carmen Doherty (46th in 27:20). There were 65 runners in the girls high school race. Visit www.baumspage.com for a complete list of results of the 2017 TVC championship meet.